Well the rumors were true and the plug was unceremoniously pulled on the spring league known as the Alliance Of American Football. By all accounts, financier and Carolina Hurricanes owner Tom Dundon was the one who decided to cease operations rather than fund a money losing endeavor for the next few weeks. I was a fan of the league and enjoyed watching the games on Saturday and Sunday the past couple months. I had picked the Apollos as my favorite team and they looked like they were on their way to a championship, before the players were sent packing. Figures. Overall the league presentation was decent and some effort went into the uniforms, stadiums and fields, to give it a real league feel. Unfortunately, it seems people in general just were not interested in watching football and other then in San Antonio, crowds were sparse and no one really was paying attention. They gave it a try, though and they were not the first startup league to fold and I’m sure they won’t be the last. Next season we will see the reemergence of the XFL, which even with the incredible pile of cash Vince McMahon has set aside, will be climbing uphill to make it long term. As someone who will watch any sort of football I can find, I really like an idea of Spring football, but so far it just hasn’t worked. Now I have to wait until the CFL starts up in June. With the end of the AAF, let’s take a quick look back at the other leagues that tried and failed to either compete with the NFL or be a feeder league. The NFL wasn’t always the mammoth league it is today. Back in the 40s it was just another minor league or niche sport. The major sports being Baseball, Boxing, College Football and horse racing. There were a bunch of pro football leagues in the early part of the 20th century and most of them disappeared and at this point are long forgotten. One such league was the All-American Football League. Never heard of it? Well, you definitely have heard of at least a few teams in this league. The league was one of the first to have a real chance at challenging the NFL. The league had teams like the Chicago Rockets, Los Angeles Dons, Buffalo Bills, New York Yankees and the Miami Seahawks. In addition to those teams they league also featured three teams that would eventually merge with the NFL in 1950, the Cleveland Browns, Baltimore Colts and San Francisco 49ers. The Bills and Colts were unrelated to the current teams. Hard to imagine now, knowing how it played out, but the AFL was just another upstart league looking to compete with the NFL. Only that time it worked and as we all know the league would merge with the NFL, becoming the only league to actually defeat the NFL in a way, forcing them to merge leagues. I have talked plenty about my love of the World Football league. I even have a favorite team, despite the fact that the league folded before I was even born. The league who had teams like my Philadelphia Bell, New York Stars, the original Houston Texans, Birmingham Americans/Vulcans, Jacksonville Sharks, Memphis Southmen, Southern California Sun, and The Hawaiians amongst other great teams. Ultimately, like the AAF is turning out to be, the WFL was basically a con. Papering the house with a stadium full of non-paying fans and players who were basically playing for free lead to a league that folded midway through the second season. The league closest to really competing with the NFL of course was the USFL. We all know the story of the league. Overpaying star players to entice them to play in the league and eventually attempting to move to fall to directly compete with the NFL lead to the end of the league after a few seasons. The league made a lasting impression on football fans with many of the teams still iconic and memorable parts of football history. As the 90s began so did another startup league. This time it was the World League Of American Football, who played their games during the spring and summer, fielding ten teams all over North America and Europe. While their was pretty decent support in Europe, the teams in America were largely ignored. After the 1992 season the league would go on hiatus until 1995 when it returned as a European only league eventually becoming NFL Europe and NFL Europa, finally folding for good in 2007. In 2001 the spectacle of football was raided up a couple notches with Wrestling Impresario Vince McMahon bringing us the XFL. with crazy nicknames, extreme rules and team nicknames, this was football to the max. In the beginning it was very well received, with rating through the roof the first week. I remember being excited about the league, until I saw the actual games, which were not good. For some reason, I don’t have the same nostalgia for the XFL that I do for the USFL or WFL, which is odd because I was either too young to remember or not yet born when those two leagues were around. Ultimately, like the leagues before it, people were not so interested in minor league football and the league disappeared after one season. Although, in the world of the film The 6th Day, the XFL was the most popular football league in the country. Guess that prediction of the future was a little off, or was it? There were also a few other less memorable leagues like the United Football League, which has mostly been forgotten, even though they actually existed for three and part of a 4th seasons. The league was not great and the uniforms were awful. It was not surprising that they just didn’t have the money to sustain and eventually folded as well. It turns out starting a professional football league is hard. No matter how many announcers you have pretending to care about the games or tV coverage or initial ratings, you have to convince the public that your league is something they should care about. Instead, these leagues are mostly ignored and then forgotten. The people I feel the worst for in this AAF situation is the players and staff members who were looking for their opportunity to show that they could play. During the past few weeks, watching the games was sort of sad, knowing that these guys were putting their bodies on the line for something that would be folded within a few weeks. Very hard to watch the announcers pretending it wasn’t even a possibility all while the league was failing. I just wonder if the AAF will be as nostalgic as the other failed leagues. Will some blogger somewhere speak of his love for the Arizona Hotshots or Memphis Express or will the league be completely forgotten? One of my favorite parts of baseball caps is the team colored iconic MLB logo. I remember back in the 90s, New Era, which is headquartered in Buffalo, had a tent sale in the parking lot of an old Gold Circle Department Store they took over as a warehouse, where they sold a bunch of damaged or error hats. For a few bucks my brothers and I each got a hat. I went with the Seattle Mariners because I was super into Grunge Music at the time and I decided the two were somehow related. My brothers got a Marlins hat and a Pillbox Pirates hat. Unfortunately all three vanished over the years, but I have more than made up for it with my always growing hat collection. I remember my Seattle hat was an error because it was missing some of the colored thread in their logo on the back of the hat. That logo, designed by Jerry Dior was added to the caps in 1993. Custom 3d Wood Logo of your choice, made to order. You pick the logo, letter or shape. Final product will be 7-10 inches depending on the logo choice. Please allow 7-10 days for shipment. 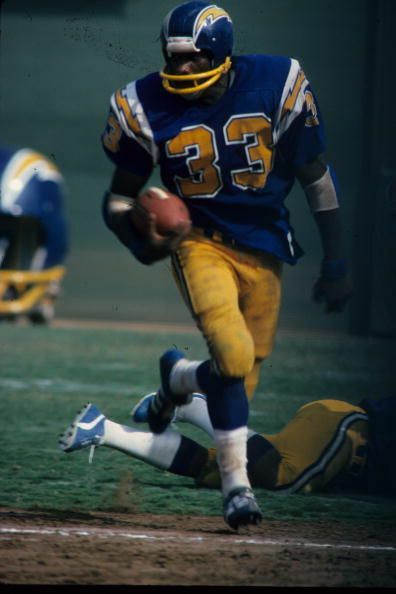 The Chargers were one of the first teams to add a colored Facemask and I just love the yellow mask. 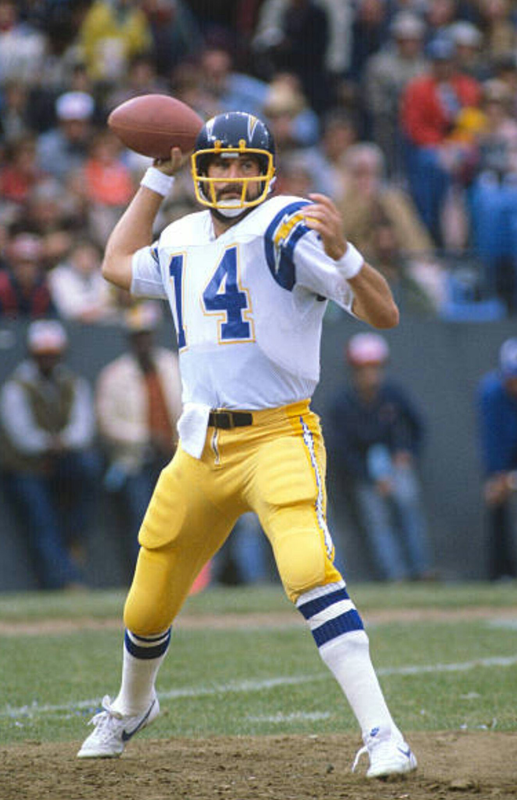 The Dan Fouts era of Chargers uniforms is by far my favorite. Especially with the yellow pants!